Looking for the best domain registrar to register your domain name for your business, blog or company? Your search for the best domain registrar end here because in this article I have listed top ten best domain registrar to register your domain name in 2018. Your online journey starts with an email ID, and Domain names are your primary gateway to the Internet. Once you have got the brilliant idea for hosting a blog or website or creating a website for business, It confirmed that you are going to want a creative domain. However, If you want to get some domain name suggestion, You should read the recent article of best domain name generators tools and the checklist before registering a domain name. No Matters, It is a small business, Company or blog. Good domain registrars hold great importance because they help you to manage your online name and fame. It is important to know about the best domain registrars so Your domain name and You will be in great company. Before We dive into the domain provider list, let us first discuss a few important things related to domain registrars. A domain name registrar is an organization or commercial entity that manages the reservation of Internet domain names. A domain name registrar must be accredited by a generic top-level domain (gTLD) registry and/or a country code top-level domain (ccTLD) registry. The management is done in accordance with the guidelines of the designated domain name registries. In simple word, A domain registrar is a service that lets you register and purchase domain names of your choice. Domain name registrars/providers have accredited by ICANN(Internet Corporation for Assigned Names and Numbers), an organization which has delegated the responsibility to manage the Domain Name System. Domain name is like Name of Your House. Let’s take an example. You have a house having house number or flat number 3031. Now What if Someone asks a guy if he/she know where is your house or the flat number. Most of the time, No one will able to tell the exact location even after he/she have visited your house before. Remembering each house number is difficult, and so if you have no domain, you might get an IP (Internet Protocol) address something like 99.101.23.09. It is hard to remember the exact number and dots required. Now We name the house to something like BillyHome. Now if someone asks about the Billy home most of them will able to answer the location of the house. The same thing is happening with Domains. Once You get a domain like mydomain.com/.net Most of the people will remember it. Now You come to know that Remembering IP addresses of different websites is a terrible job, so that is why Domain Name System (DNS) was introduced. For Quick information, The world first domain name registered on 15th March 1985 with the name of Symbolics.com (Symbolics Inc.) by a computer firm. As the Online activity increased, the domains are now selling fast, and it is the right time to get yours. 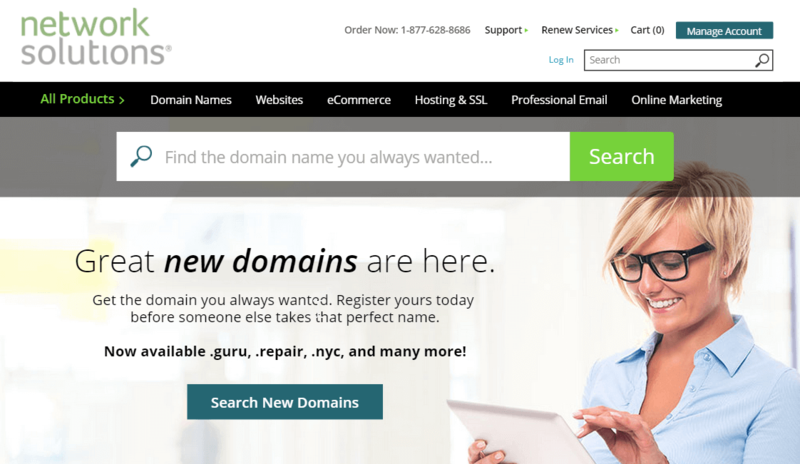 Most domain providers are making it dead simple to purchase, renew and manage your domain names. Still, You need to choose the domain registrars wisely as each has their own pros and cons. Below, I”ll show You what you need to look out for when choosing the right domain registrar. How to Choose the Best Domain Registrar? When You search for domain registrars, you get a lot of options to register your domain name, However One wrong choice and you will end up paying more than others. Sometimes it is more worst if they lock your account, steal your domain. However, Cheap domain registrars are not always bad. Some of them are more secured, featureful than other famous domain registrars. Following are some features that you must consider in your domain. ICANN accreditation: The registrars should be ICANN accredited, the organization who manages all the domains which you purchased from the company. Never Go with domain resellers who just buy domains on behalf of you from the different domain registrar. Reputation: Do They have best reviews? A scam company not only can waste your money but also harm your business/blogging. Therefore it is pretty important to select a company that offers good reputation and creditability. Freebies: Offering freebies like first-year discount/free whois privacy is an excellent way to attract customers. Freebies are good but also should be valuable because no one wants craps, are you? Security: The registrar should be trustable in terms of security and availability. Check if is it trusted by existing users? You can easily find user reviews about any domain registrar searching on the web. Control Panel: The most important factor in selecting a domain registrar. An easy to use control panel makes easier to setup and manage the domain name, and thus it saves a lot of your time which can utilize in other important things. The smooth and swift control panel and DNS management system helps you to easy to navigate to the selected option. Domain Transfer: Sometimes for some reasons like high renewal rates you might want to transfer your domain name to another domain registrar. So, before choosing any domain provider must check their transfer fees. 99.9% domain registrars usually don’t ask for any Extra fees. Renewal Fees: Online companies like web hosting and domain providers usually offer a big discount for the new customers on their first purchase or new registration. And some of them ask more than normal fees at the time of renewals. So, you must verify renewal terms and pricing to avoid any higher renewal rates. Some of have same renewal pricing such as NameBright and Namesilo. Some domain registrar solely offers domain names registration, but most of the companies offer both domain and hosting. So, The benefits you get when purchasing web products (domain and hosting) from the same provider is that you don’t need to point or To change DNS/Nameserver setting and most of the time you get free domain with the annual subscription of selected hosting plan. Warning:I will always recommend you to buy the domain and hosting from two different providers. This is because it is important to keep your domain safe. What if you not like the hosting you buyed and want to cancel it? Deleting domain is not a good idea. The domain is something which you should never lose. Otherwise, you will end of seeing your domain in Hugedomains or in hand of domain catchers. You can’t test best domain registrar by canceling and registering the same domain as we can do on web hosting. Let’s manage domain on best domain registrar and hosting on best hosting provider. Now, Feeling confused about which domain registrar will be best? You don’t have to be. I will walk you through the different best domain name registrar that I use and recommends. *Pricing is for .com Domain Extension for the first year of registration or run as a Promotional Offer for new Customers. Godaddy has been synonymous with domains and hosting established in 1997 as a Jomax Technologies, which later became Godaddy. Godaddy is the world’s largest domain Registrar Company with ICANN-accredited registrar and e-commerce industry with a market share of over 30%. I think Godaddy is best for buying the domain name for the newbie, according to me their hosting service is not very good as sometimes you will get affected by viruses. If you are looking for best web hosting providers, I would like to refer this article of Best WordPress Webhosting Providers in 2018. Renewal Pricing is high even after using coupons. As the name says itself, Namecheap stands among the cheapest domain registrar and hosting service providers. It is a great company to register your new website address at the affordable price for most of the domain extension. HostReview selected Namecheap for “Reader’s Choice Award 2013”. NameCheap offers web hosting includes Shared, VPS, Dedicated Server and Email hosting at low prices. Their domain management system is very flexible. In 2010 to 2015, Namecheap selected as a best domain name registrar in Lifehacker poll. Richard Kirkendall founded Namecheap in 2000. Namecheap is a better alternative to Godaddy also offers SSL certificate at the budget price. The plus point is that domains from Namecheap come with free whois privacy. I have registered my first domain from Bigrock India. BigRock is an ICANN accredited leading provider of web-presence solutions to small-businesses, professionals, and individuals. BigRock provides a wide range of online products includes – domain registration, business-class email services (including anti-spam & anti-virus features), web-hosting services, website builder products, e-commerce solutions and digital certificates. BigRock is a part of the Endurance International Group. Endurance International Group is a publicly traded (NASDAQ: EIGI) technology company that helps power small and medium-sized businesses online. Provides hosting and SSL at lower prices with an amazing discount. This is another cheap and well-known best domain selling company in this list. If you’re looking for a reputed domain registrar that has a good number of customer service, I think 1and1 is the one you need. 1and1 has been around since 1988 with good customer reviews. They offer the cheapest price for first-year domain extensions .com .net and .info The company offers multiple features along with the .com domain including one free email account, WhoIs add-on, and domain lock, etc. You surely have to pay more for renewals, but they align with other domain registrars listed here. Unlimited hosting + free domain for the first year at only $1/year. Hosting is free for the 1st year which is a USB for any registrar. What is better than the one who gives you everything online now can host your domain name? When you’re looking to register your domain, Google domains now compete with reputable domain registrars. Google domains’ interface is clean, minimal like Studiopress themes(Genesis Framework themes) and doesn’t hurt you with a lot of links/banners or anything. Google domains are only for registering domains. You can use Google Cloud services if you have some knowledge in cloud based server. 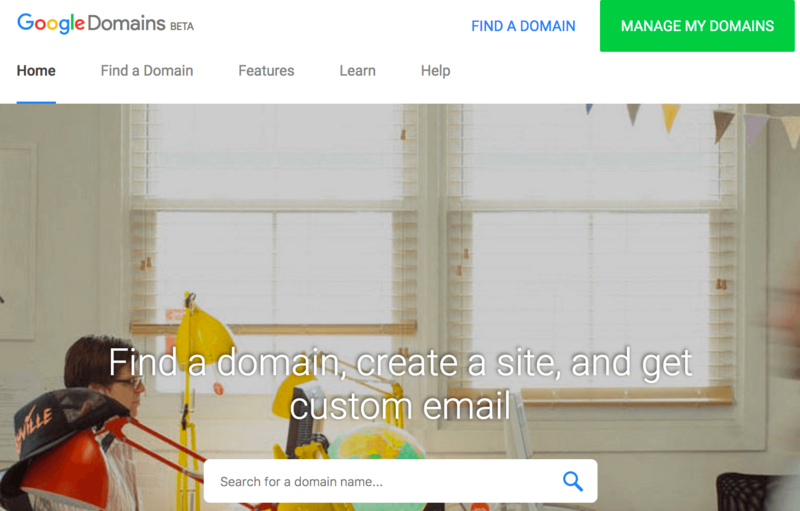 The best thing about is that you can integrate Domain from Google domains with G suite(Known as Google apps) for an additional price of 5$/month to get the custom brand email like yourname@yourdomain.com and online storage, Team management solutions and more. Get Up to 100 email aliases to that can point your business emails (hello@yourcomapany.com) to your preferred or existing emails (like yourname@gmail.com). Namesilo is my favorite domain registrar which is one of the cheapest and also the most transparent as far as pricing is same for renewals. Namesilo offers more competitive domain registrations rates and doesn’t have renewal up charges which are a deal maker when you are registering domains for the extended period. No hidden fees– Namesilo is transparent in pricing and has no hidden charges, upsell pushes or minimum purchase amount required for their customers. Premium Domains: In case you’re looking for domain trading and flipping/buying premium domains, Namesilo has a wide variety of domain investor’s tools which help you to track and trade up to 1000s of domains at a time. Premium domains with their own custom landing page without any extra cost. No additional charges which are ideal for long-term use. NameBright is a popular domain name registrar created by the team at TurnCommerce, having one of the largest domain portfolio holders with over 1+ million domain names. This domain registrar has the partnership with Hugedomains(premium domain seller) and dropcatch (auto domain catcher for hugedomains.com) auto registered by Namebright. You can check How many domains have in the list of Hugedomains.com :/ some of my domains are also there. Two-factor authentication helps you to add the extra layer of security. Free Whois pricing is for first Year registration. Like above domain registrars, Name.com is also an ICANN accredited domain registrar which helps you to register, renew or transfer domains quickly from their Dashboard. Name.com is a well-known company and has a good online reputation in the field of domain registration. Their hosting plans start from $3.99 per month, and domain registration price is $10.99/year. They also provide web hosting and other services like SSL and website builder and G suite(Google Apps) integration. The Website is minimal, and domain registration is a breeze. They have clear options to look out for future extensions and expiring domains including backorder services that will help you in grabbing your desired domain. Customer support is average. Phone service is not available on weekends and no live chat option which is disappointing. The United Domains Group includes United Domains Inc. (Cambridge, MA) and the ICANN-accredited registrar united-domains AG (Munich, Germany). Their mission is to make domain registration affordable, transparent, and simple. Uniteddomains offer 400+ domain extensions, along with domain privacy, free domain pre-registration, and unparalleled customer support. A full range of domain extension available within a click. Network Solutions is a Web.com Company. It provides the essential tools that businesses need to build and manage their online presence. With over 15 years in the industry, 50 products, 2 million domain names under management, and hundreds of thousands of satisfied customers Network Solution is the leader in online small business tools. Domains are cheap for the first year. However, Here are some more domain registrar having a good reputation. To sum up the list of top best domain registrars for domain purchase, I’ve listed the ones that are the best as per my research and personal experience. If you’re buying a domain for the first time, I suggest going with Godaddy or NameCheap since they have the best interface and onboarding experience plus are budget friendly. If You are a Blogger and want something with great features, Namesilo is your next registrar. However, if you want to set up a website and start blogging you should choose Bluehost which means you get a free domain name with your hosting account. Thank you for the best domain registrar list. I personally use namecheap for domain registration. Godaddy is also good. I will try the other domain registrars. Thanks for sharing this awesome list of domain registrar. 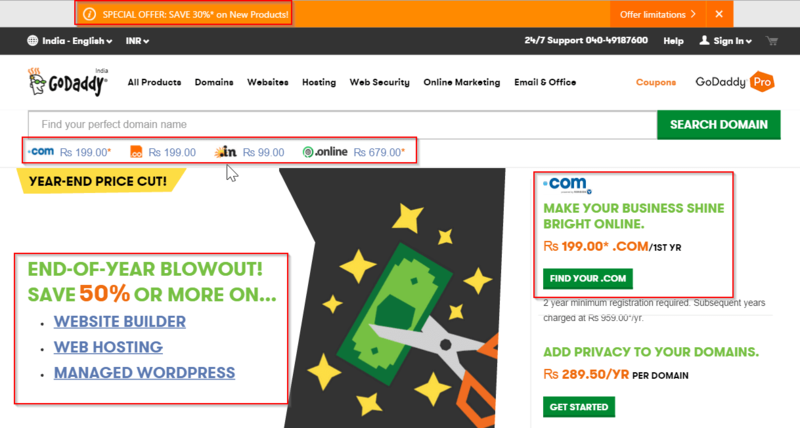 I have bought the .com domain from godaddy in rs123. Such a great list of domain providers. 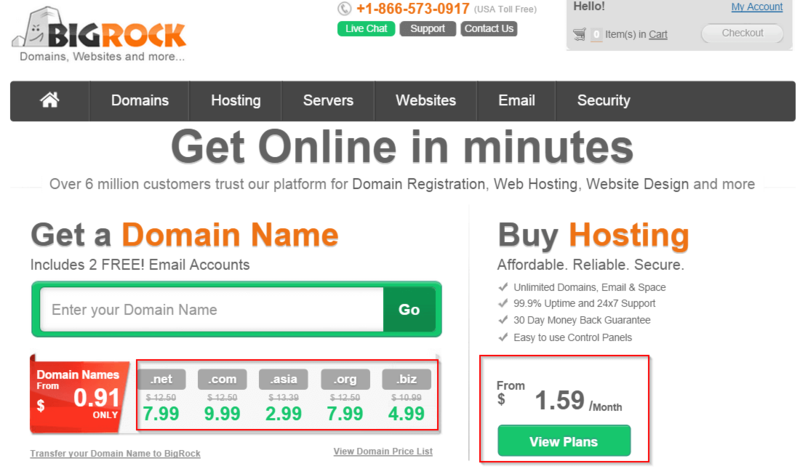 Namecheap is good but i think bigrock is good for first year of registration in rs99 offer for .com domain. Thank you for making the list of best domain registrar. I would suggest you to add some more registrar depend upon countries. 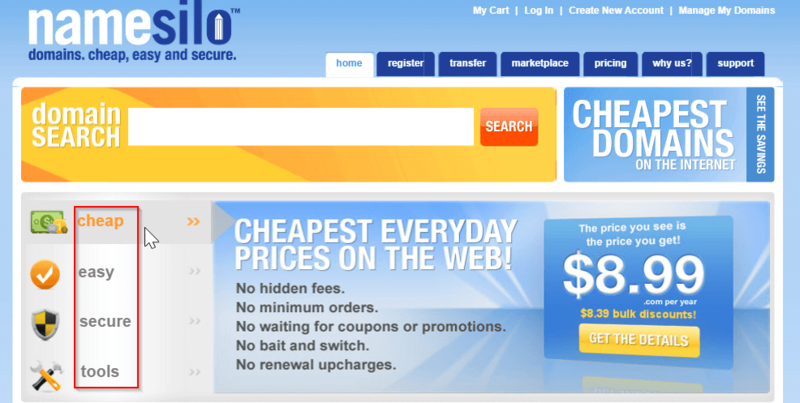 Namesilo seems a sweet deal for long-term sites. Thank you for the information. I have moved to namesilo as they are providing free whois protection. Yes, Namesilo is good for long-term domain management. I am using 10-20 domain have parked on Namesilo. But finally I found someone is agree with me, all the other sites are promoting EIG companies as the best domain registrar.